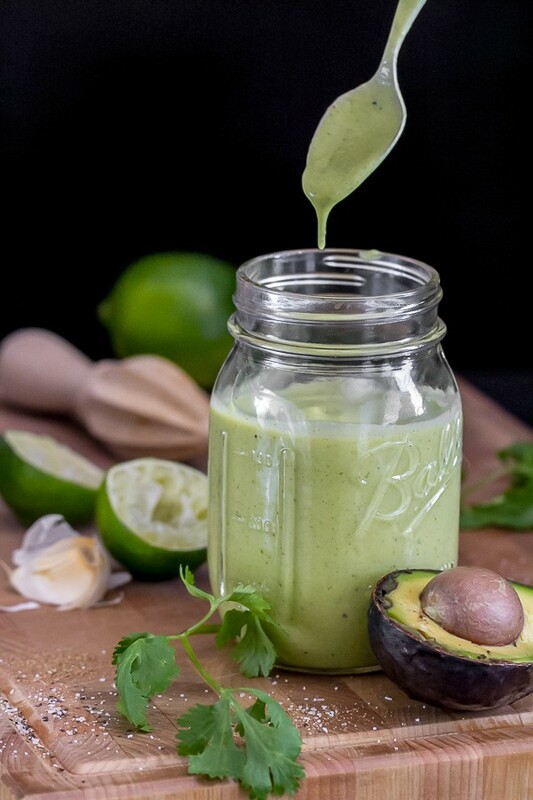 I’ve made this Avocado Cilantro Lime Sauce several times over the past year or two. It’s really delicious and equally fantastic on salads, grilled meats, fish tacos, etc. I like it so much I thought it was about time to share it here for you all to enjoy as well! 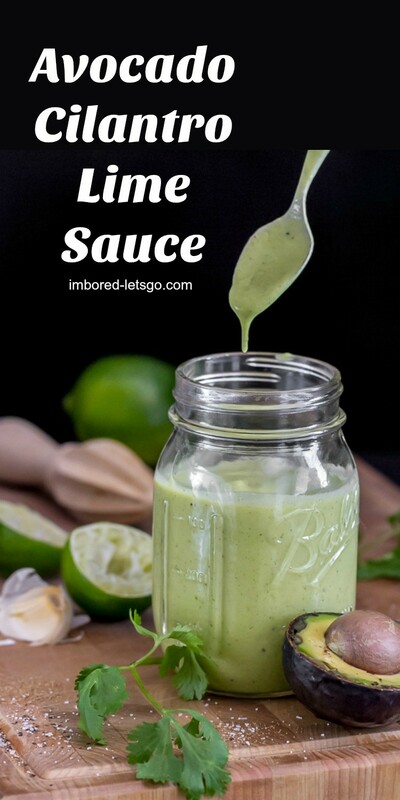 The first time I made this avocado cilantro lime sauce (I guess you could also call it a salad dressing) I was making a grilled steak salad. Instead of making my favorite Chipotle Honey Lime Vinaigrette I decided to make a dressing with a few of my all time favorites: avocado, cilantro and limes. I came across a recipe that included orange juice that sounded intriguing so I tweaked the recipe and added some garlic, a little cumin and green tobacco sauce as well as the zest from one of the limes. This Avocado Cilantro Lime Sauce is a creamy sauce, a bit on the thicker side. If you want more of a salad dressing consistency, just add a couple tablespoons of water. Not only is this sauce fantastic on grilled steak salad, I think it would make a great dip for a party tray…you could dip all sorts of vegetables in it or, better yet, how about some shrimp? Tonight I plan on using this tasty Avocado Cilantro Lime Sauce on a Southwestern inspired grilled romaine salad. Stay tuned for that recipe later in the week! Combine all ingredients in a blender or food processor and blend until smooth and creamy. Store in refrigerator. If you'd like a thinner sauce, just add a bit of water while blending. This sauce looks amazing! I’d love to try it spread on a good burger. I bet it would be fantastic on a good burger!!! You sound like me–find a recipe that inspires you, and then start tweaking! :o) I make a version of this, but now I’ll have to try yours! Yum. Yum – licking my lips thinking of this! Sounds great. I can imagine it drizzled over fish, too! I’m totally the type that would love this sauce as a dip 😀 Can’t wait to try it! What a useful sauce! Thanks for sharing! Avocado, lime, and cilantro make the best sauce! I’d put this on almost everything. This dressing sounds amazing! It would be perfect to drizzle over the quinoa beet salad I’m eating right now for lunch! Yum! This would be great with chips. I love avocado salsa. Does this keep in the fridge for a few days? Moms are feeding high school theater department a taco bar at their next competition. Can this be made the night before, stored in air-tight container, and used at lunch the next day without turning brown? I’ve heard if you put the avacado seed back into any recipe using avacado, it delays the browning … any thoughts on this idea? It should be fine since there’s lime juice and other stuff in there.